So much of Maurice’s Jubilee springs from nostalgia, reflection and memories of yesteryear that it is unsurprising to find this charming piece of theatre as a whole lives and breathes as something of an endearing reminder of theatre productions and drama pieces of old in and of itself. Offering shades of Alan Bennett and occasional hints of Mike Leigh, Jubilee is a treat; a quality demonstration of writing, acting and direction that feels both fresh and established at once. We enter the home of Maurice Hodger (Julian Glover), struck with terminal cancer and approaching his 90th birthday when he is convinced he will be visited by Her Majesty the Queen after a supposed encounter and promise made with her the day before her coronation 60 years prior. 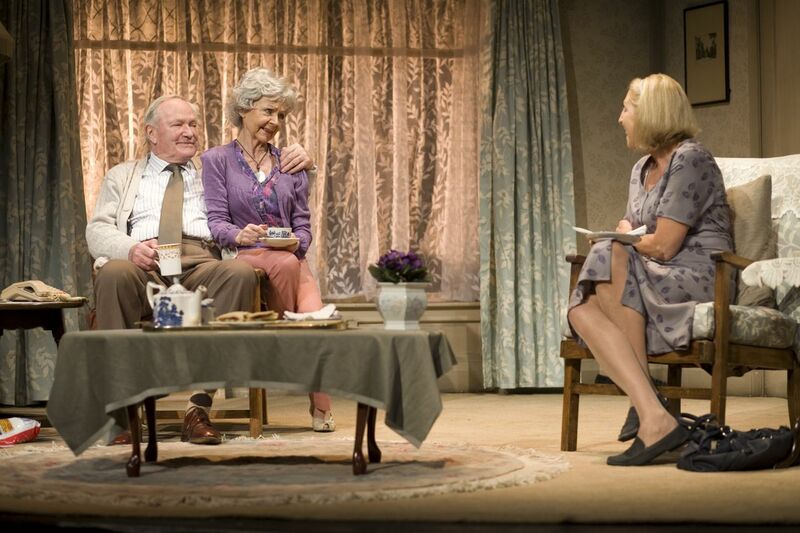 His wife Helena (Sheila Reid) believes it to be a whimsical fantasy, though as the play progresses shadows of resentment and marital struggles come to the surface under the shadow of Maurice’s lifelong dedication and obsession with HRH. 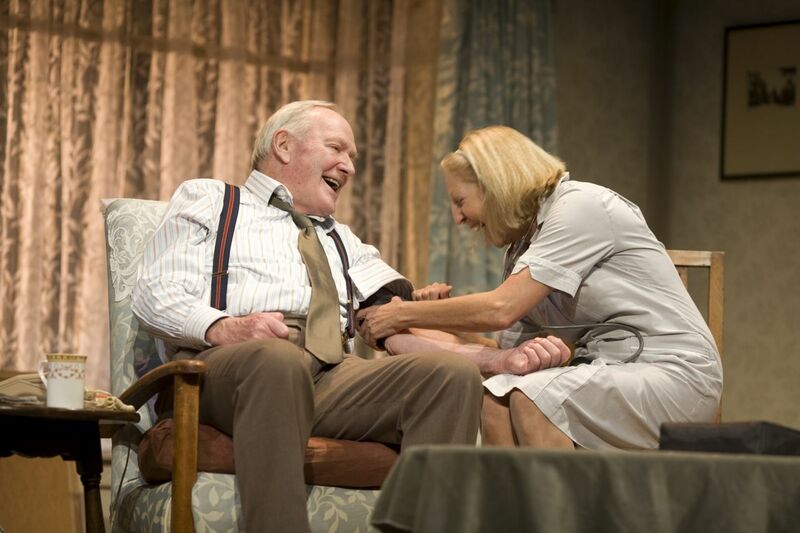 Nichola McAuliffe (also the plays author) completes the ensemble as Kate, the single, never-married middle-aged nurse whom comes to live with the Hodgers to assist Maurice in what have been diagnosed as his final weeks. A measured, inviting first Act introduces the characters and dynamics effectively, immediately introducing a wonderfully witty and light-hearted comedic undertone that prevents the show from becoming too heavy or ever taking itself too seriously. The second Act that may stray a little too close to parody and incredulity for some tastes, but is where the play really springs to life, offering a supremely satisfying and entertaining conclusion to the delightful story being told, and featuring a hilarious yet heartfelt two-hander between Glover and McAuliffe that establishes it as a terrific, character-driven piece of both drama and comedy. 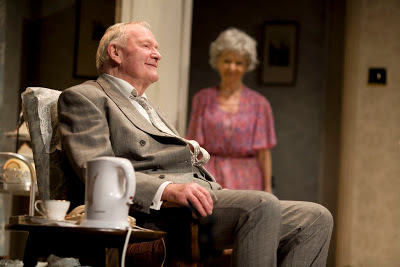 Julian Glover is terrific as the titular Maurice, proud yet wily and able to switch between the sombre and sarcastic in a wholly believable and effecting turn. Somewhat predictably for this ilk of drama, shadows of the past and daemons from yesteryear slowly begin to simmer to the surface, and Glover charts the emotional journey of his character with tremendous subtlety and authority, never resorting to excess or overt theatrics, yet readily whips out jokes about viagra or waxes lyrical about his love and understanding of diamonds and jewellery with real vigour and charm. It’s a wonderfully written and beautifully realised character. Sheila Reid puts in sterling support as Helena, even though she is in some ways a little neglected by the script during the second half of the play in particular. Some of the financial and emotional baggage she has carried as Maurice’s wife is introduced early on, followed by hints at the strain of his illness and impending fate, but none of these are really developed much further. This is not necessarily a negative thing however, as the character ends up becoming more rounded and believable thanks to these fleeting implications and allusions to her struggles and insecurities as opposed than any protracted monologuing or egregious emotion. Reid is given plenty of one-liners, comedy moments or even dramatic outbursts, but both she and the character are at their most effective in the quiet trembles, the momentary pauses, and the more reserved nuances of a woman who has spent her life never quite feeling altogether in the spotlight of her husbands affections. Nichola McAuliffe imbues her character Katy with something of a naive, girlish innocence and develops a wonderful rapport with Glover’s Maurice in particular, and the burgeoning friendship between the two is, like so much of the play, not over-played or over-written, but an engaging and believable dynamic that in Act 2 morphs into something wholly different yet equally appealing. To discuss too much of the plot would spoil the experience considerably, but McAuliffe really comes into her own and ends up threatening to steal the entire show, though thankfully Glover’s passionate performance keeps things grounded. Despite a somewhat disappointing and predictable (for this reviewer at least) denouement, Maurice’s Jubilee ends up proving to be a real treat - a delightful, occasionally moving and frequently funny piece brimming with heart and wit. It touches upon issues of love, obsession, old age, jealousy and a wealth of other innately human conditions and issues with subtlety and charm and a genuine spring in it’s step. Endearingly old-fashioned without feeling dated or inconsequential, Maurice’s Jubilee gets the royal stamp of approval and deserves to stay around long enough to celebrate a few jubilees of its own. MAURICE'S JUBILEE is running at the New Alexandra Theatre, Birmingham from Wednesday 6 March to Saturday 9 March 2013. CLICK HERE for more information on the shows' run at the New Alexandra and to book your tickets! Press tickets for this performance of Maurice's Jubilee were provided courtesy of The New Alexandra Theatre, Birmingham directly. (A)musings Media gratefully acknowledges their generous invitation.